The Unmatched Courage of a Soldier. The Ultimate Sacrifice of a Town. The Unparalleled Vision of a Workforce. Mississippi. A Legendary Force for Freedom. - Mississippi Believe It! Home » Resources » Campaign » The Unmatched Courage of a Soldier. The Ultimate Sacrifice of a Town. The Unparalleled Vision of a Workforce. Mississippi. A Legendary Force for Freedom. And for over 75 years, one Mississippi workforce – Ingalls Shipbuilding – has helped bring freedom to those who seek her elusive grasp the world over. One man. One town. One workforce. One state. 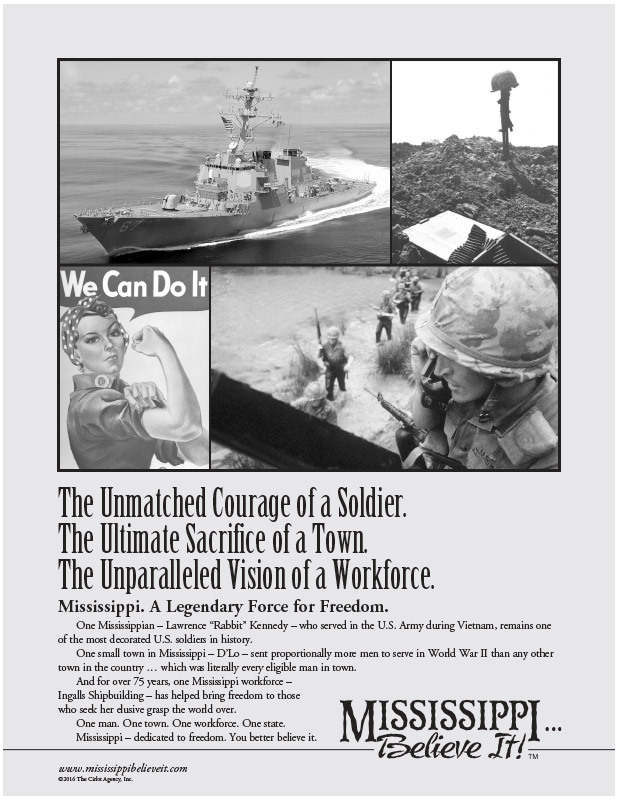 Mississippi – dedicated to freedom. You better believe it.